Vertical Autoclave Single Wall Fully Automatic is fitted with Pedal Free System. This system enables you to lift the lid very easily and safely. It also reduces the loading height. This allows the user to lift the lid by only 3 to 4 mm. Flexible load sensor is a unique feature in Fully Automatic Autoclaves.Flexible Load Sensor enables the user to place the load sensor anywhere in the chamber. This can be placed in the Flask, Petri dish, Linen or any load. This enables the user to track that desired temperature is achieved in the load or not. Micro Processor Controller controller provides facility to program the cycle, with a feather touch panel. Fully Automatic Autoclave provides the user option to select fast cooling or slow cooling depending on the load configuration. Robustly Built Chamber is fitted in Vertical Autoclave built with the latest welding technique which gives higher working pressure and test pressure. Robustly built chamber is capable of giving working pressure of 20 PSI and Test pressure of 60 PSI. Silicon Gasket is provided in Vertical Autoclaves with high quality food grade Silicon Gasket which ensures longer durability sealing under the pressure. 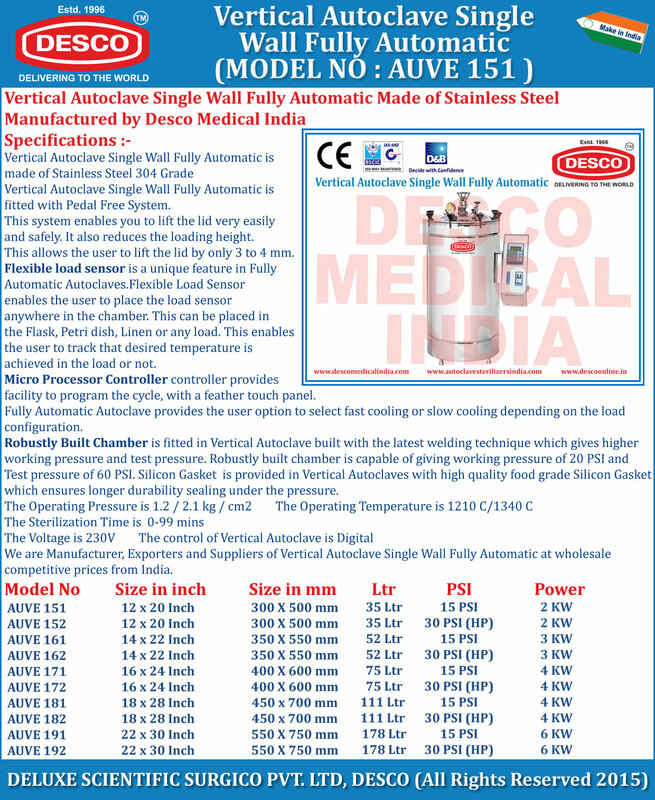 We are Manufacturer, Exporters and Suppliers of Vertical Autoclave Single Wall Fully Automatic at wholesale competitive prices from India.